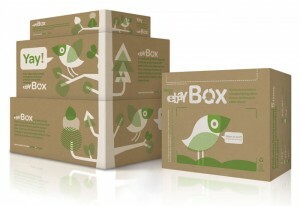 eBay just launched a new set of eco-friendly reusable boxes as part of a pilot program to make packaging a little greener. Starting in October, the company is giving away 100,000 shipping boxes to eBay sellers, and encouraging reuse. According to eBay, if each box gets used five times, the program could protect nearly 4,000 trees, save 2.4 million gallons of water, and conserve enough electricity to power 49 homes for a year. The boxes engage sellers by emphasizing potential benefits to the planet with friendly illustrations and copy. Tips for greener packing include finding “a new calling for old phone books.” A happy little bird asks, “Where to next?” And to track each box’s journey, there’s space to write a note so the next person to receive it can see just how far its come. 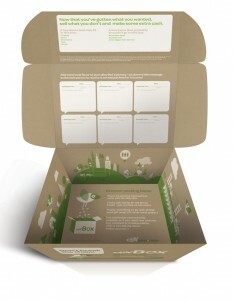 The company will also set-up a special web page for the recipients of the boxes, on which they can register their box and give updates on its condition. The company will use the information to track the boxes and plan future replacements when a box gets too damaged.